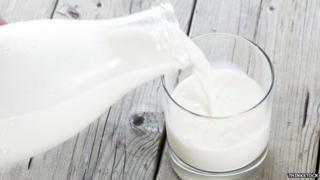 Drinking lots of milk may not lower the risk of fracturing bones, a study in the British Medical Journal suggests. The research, conducted in Sweden, showed women who drank more than three glasses a day were actually more likely to break bones than those who had less. Researchers then tracked how many developed fractures and how many participants died in the years afterwards. In the 20-year follow-up period in which the women were monitored, those who drank more than three glasses, or 680ml, of milk a day were more likely to develop fractures than those who had consumed less. Prof Karl Michaelsson, lead researcher at Uppsala University, said: "Women who drank three or more glasses a day had twice the chance of dying at the end of the study than those who drank less than one glass a day. "And those who had a high milk intake also had a 50% higher risk of hip fracture." Men were monitored for an average of 11 years after the initial survey and the results showed a similar but less pronounced trend. When fermented milk products such as yoghurt were considered, the opposite pattern was observed - people who consumed more had a lower risk of fractures. "Our results may question the validity of recommendations to consume high amounts of milk to prevent fragility fractures. "The results should, however, be interpreted cautiously given the observational design of our study." Dietary advice should not be changed until more research had been conducted, he said. Prof Sue Lanham-New, from the University of Surrey, said the study was of limited use. "We do not have a feel for the influence of physical activity or other lifestyle habits important to bone or overall mortality. "And the effect of increasing body mass index has not been fully investigated in this study. "Milk and dairy products in the UK provide 50-60% of the calcium in our diet. "We know that low calcium intake (less than 400mg a day) is a risk factor for osteoporosis. "Individuals should still be encouraged to consume a balanced diet from the five key food groups of which milk and dairy are key."